This rich and creamy no churn dairy free ice cream is made with whipped chocolate coconut cream and marshmallow fluff. The marshmallow base means that you’re halfway to rocky road ice cream right at the start! When the weather is warm, ice cream is basically a food group. 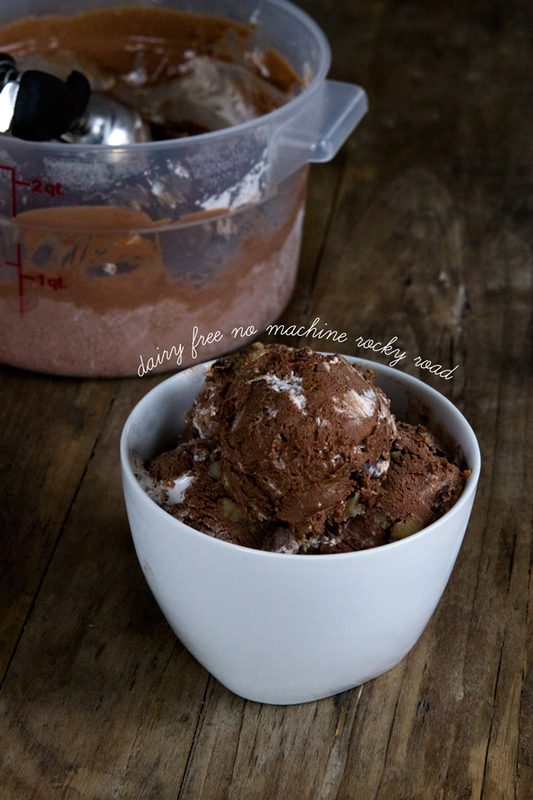 It is in that spirit that I present to you … rocky road dairy free gluten free ice cream. No machine, no gluten, no dairy, precious little coconut flavor. Deep chocolate, with all the charms of rocky road and the smoooooooth texture of the very best ice cream. And this time … no sweetened condensed coconut milk to simmer and fuss and then cool. BOOM! I toasted the chopped walnuts (a few minutes over medium-high heat in a dry cast iron skillet does the trick) but that step is optional. If you keep it super simple, this will take just a few precious warm weather minutes to throw together. The inspiration for this ice cream recipe is brought to you, lovingly, by last week’s Marshmallow No Bake Cheesecake. I told you I’d be experimenting. I made homemade marshmallow fluff, because it just happens to taste fantastic (on & in everything, including on a spoon). But it really is absolutely not required. I mean, unless you really want to. The major commercial brands (Kraft + that Fluff brand or whatever it is that comes in that enormous tub that my grandmother used to eat out of with a spoon, and with no shame whatsoever) are safely gluten free. That part is up to you. Making this gluten free dairy free ice cream? Mandatory. *You must use full-fat coconut milk. Thai Kitchen brand coconut milk and Whole Foods 365 brand coconut milk both work well consistently for this application. Remove the two cans of coconut milk carefully from the refrigerator, without shaking them at all. The solid should have separated from the liquid during chilling, and you don’t want to reintegrate them. Remove the lids from the cans, scoop out only the solid white coconut (reserving or discarding all of the liquid), and place it in a large bowl. Add 4 tablespoons (20 g) of the cocoa powder to the coconut, and with a hand mixer (or in the bowl of a stand mixer fitted with the whisk attachment), whip on high speed for about 2 minutes, or until light and fluffy and nearly doubled in volume. Place the chocolate whipped coconut cream in the refrigerator to chill for about 10 minutes. The next step is to make a marshmallow base, into which you will fold the coconut whipped cream. In a small bowl, place the gelatin and 1/4 cup (2 fluid ounces) water and mix to combine well. Set the bowl aside and allow the gelatin to swell as it stands. Once the gelatin has swelled, transfer it to the bowl of a stand mixer (or a large bowl to use with a hand mixer). In a medium, heavy-bottom saucepan, place the remaining 1/4 cup (2 fluid ounces) water, sugar and cream of tartar, and whisk to combine well. Cook the sugar mixture over medium-high heat until it reaches the softball stage, between 238°F and 240°F, on an instant read thermometer. Remove the saucepan from the heat immediately, and pour the cooked sugar mixture down the side of the bowl of the stand mixer into the gelatin mixture. Whisk to combine (the mixture will bubble) and allow the mixture to cool until the mixing bowl is no longer hot to the touch (about 5 minutes). 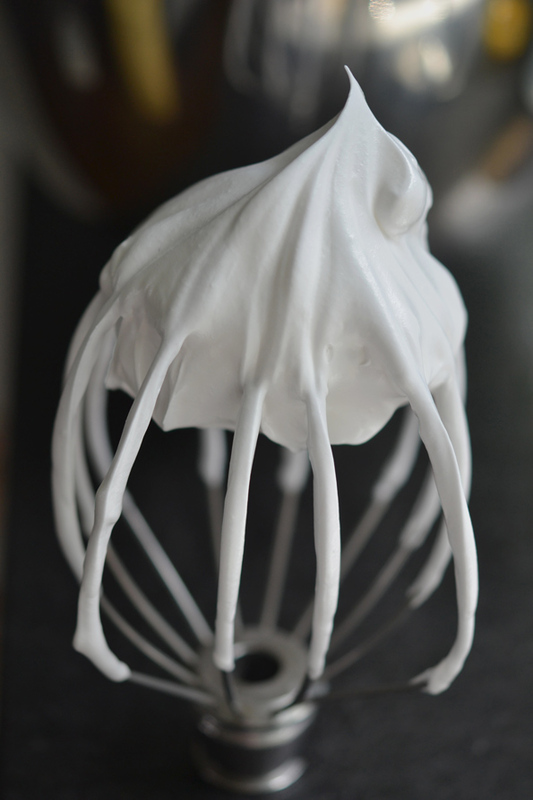 Add the vanilla and salt, and beat the mixture on medium-high speed with the whisk attachment (or with a hand mixer) until the mixture is white, thick and glossy. It should nearly triple in size. It is ready when the mixture pours off the whisk (or beaters) very slowly when the attachment is raised. 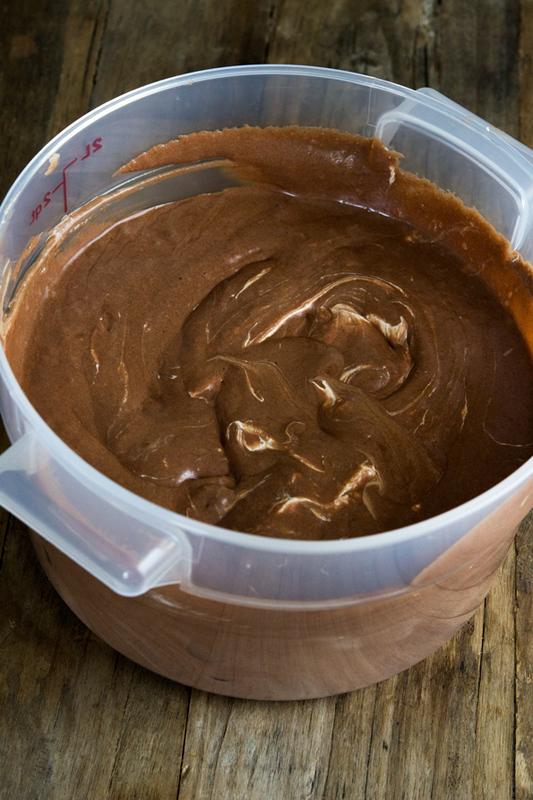 Add the remaining 2 tablespoons (10 g) cocoa powder to the bowl, and beat again with the whisk attachment to combine. Remove the whipped coconut cream from the refrigerator and add half of it to the large bowl of marshmallows. Fold the coconut cream into the marshmallows, taking care not to deflate either the cream or the marshmallows. Add the remaining coconut cream and fold in again gently. Scrape the mixture into a 2 quart freezer-safe container. Gently stir in the chocolate chips, walnuts, and the marshmallow fluff. Cover tightly and freeze until firm (about 6 hours). Serve frozen. It will not need to thaw at all to be scoopable. P.S. Have you pre-ordered Gluten-Free on a Shoestring Bakes Bread yet? Join the gluten free bread revolution! It’s gonna be BIG. Is there any way to make this without coconut milk? 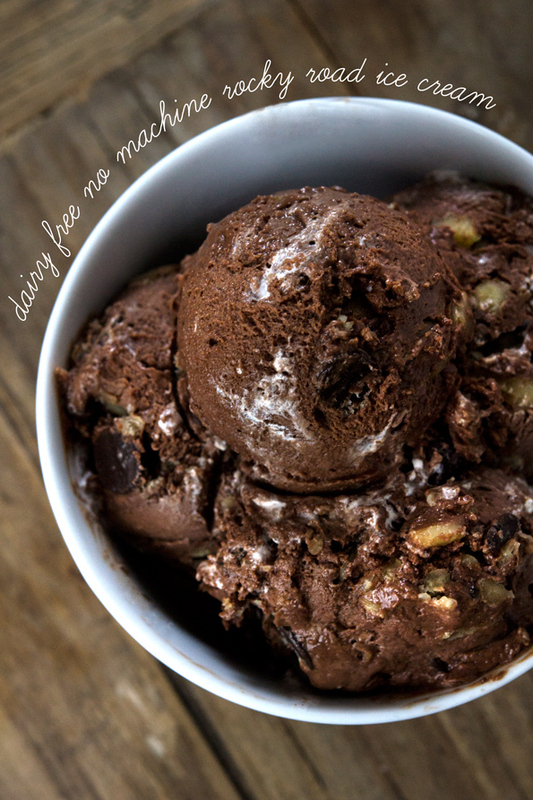 My family loves rocky road ice cream, however my husband has an aversion to coconut, also we do not require a dairy free home. I haven’t worked with agar agar enough to answer, and I haven’t tested this recipe with any substitutions, either, Kimberly. You’ll have to experiment! This recipe is completely unreal and THEN you had to go and add that cute cursive writing to the top picture which basically means I have to try this. I’m nearly undone by the homemade marshmallow fluff so I need to explore that post immediately. I, for one, will be making this “as is” without any substitutions because I don’t want to mess up a good thing. Amazing, Nicole! Oh no you didn’t. Chocolate ice cream with marshmallow fluff is my favorite flavor. And I’m so excited to not have the sweetened condensed step! I’m off to put some coconut milk in the fridge!! I have been making do with the individual molten chocolate cake. Why oh why did you have to make it so easy that I memorized it? And can whip it up before my oven even preheats to 350??? I still like the brand because I buy it primarily for smoothies (so the separation issue doesn’t matter), it’s organic, and the can is BPA free. But I may have to rely on organic Thai Kitchen if I need to get my ice cream on! Is is 1 packet and 1 scant tablespoon of gelatin, or just 1 scant tablespoon? I am assuming “scant” is a proper measure (not heaping) tablespoon. Rocky Road is hubby’s favorite, so this will definitely be happening in my house! I want to know where you got your bucket too! On another note, I made your banana pancake muffins for a pot luck brunch on Saturday (using coconut milk and without butter/sugar). Hit with all — hubby only got 1/2 one before they disappeared. Picky daughter who does not have to eat gluten free has already asked for them again! Thanks, Nicole. I’ve never used gelatin before, so I wasn’t sure. You are my kinda “girl”!! We don’t do anything with high fructose corn syrup (AKA: Karo syrup) etc and having your recipe for homemade marshmallow fluff is fantastic. It opens up so many old recipes for me and I thank you. We have been loving your no machine ice creams all summer especially the first one to which we added 3/4 pkg of butter brickle or toffee chips that were gluten free. That took your wonderful ice cream to the moon!! You should try it sometime. I’m so glad you’ve been enjoying the no machine ice creams this summer, Nana J! I like to avoid using corn syrup because it is messy and I know a lot of people don’t like it (especially those with a corn allergy), but for future reference, Karo corn syrup is not the same as high fructose corn syrup, which is the cheap sugar that we all try to avoid these days. When you say “Remove the whipped coconut cream from the refrigerator and add half of it to the large bowl of marshmallows. Fold the coconut cream into the marshmallows, taking care not to deflate either the cream or the marshmallows” are you referring to the marshmallow fluff or actual marshmallows? If “actual” marshmallows they aren’t listed in the ingredient listing. I’m ITCHING to make this recipe, but reading the instructions really carefully so I don’t screw it up! Thanks for Dairy free and GF ! Can’t wait! I just modified the instructions slightly to indicate that, when you cook the sugar and pour it into the swelled gelatin, you are making homemade marshmallows. So there aren’t marshmallows listed in the ingredients, per se, but the gelatin + cooked sugar = marshmallows. I hope that helps clarify things! Thank you so much Nicole. I love all your recipes and so far have never tried a bad one. So that is why I bought your books! Love them! Pleasure, Anita. I like your attention to detail, and your desire to follow a recipe closely. Thank you for your support of my books! Where did you get your bucket and what type of texture does the ice cream have? Thank you. As I discuss in the post, Lynn, the ice cream is smooth and creamy. The bucket is just a 2 liter lidded plastic container. You can find them on amazon, or in most cooking supply stores. This looks fantastic and thankfully dairy-free. Any suggestions if I wanted to substitute the sugar? For example, if I were to use honey or stevia, how much would I need to use? I’m sure you could make the marshmallow base with honey, but I haven’t done that myself so it would take quite a bit of experimenting as it isn’t a straight-up substitution. Stevia will not work. Nicole, I was taught 1/2 cup or 3/4 cup honey to 1 cup sugar – depending on how sweet you want. There is chemistry involved here, Mare, so the sweetness is not really the issue. Thanks! Once again a home run! this looks so yummy I can’t stand it. BUT I procured some zucchini this weekend from my bestie so I’m making the cake and the chocolate chip cookies this week! so excited!! !